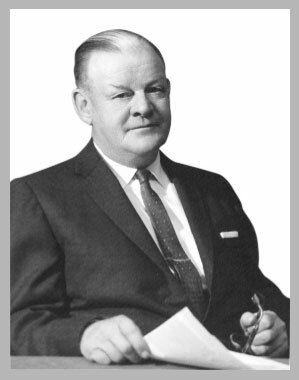 NFIB was founded by C. Wilson Harder in 1943 and maintained its headquarters in San Mateo, California, until 1992 when it was relocated to Nashville, Tennessee. Harder’s vision was to give small and independent business a voice in government decision-making through advocacy. NFIB has grown as Harder envisioned and is the voice of small business in America today. Since its early history, NFIB’s work on policy issues has been determined through a one member, one vote balloting process of its membership. This process still stands today as we advocate for independence of small business. Harder began with a home office and sold the first memberships to his neighbors. He was succeeded in 1969 by his son, John Harder, and later that year by Wilson S. Johnson, who formed the member Leadership Councils, which still exist today and are a great way for members to get engaged with advocacy. Throughout this time, NFIB gained greater recognition in Washington, D.C., and in state capitals. John Sloan, the first chief executive brought in from outside NFIB, became President of NFIB in 1983. He installed a business structure with a sales manager, finance, and administration directed by the CFO and expanded the organization’s presence through a public policy operation in Washington, D.C. In 1983, NFIB established the NFIB Member Services Corporation, a wholly owned subsidiary of NFIB, to offer benefit programs to assist members in reducing operating costs. Programs include: workers’ compensation insurance, commercial and personal health insurance, credit card processing, operational supplies, and discounts on commonly used business products and services. In 1992, Jack Faris became President following Sloan’s death and clearly defined NFIB’s role in affecting public policy at the state and federal levels through political and grassroots activism, and lobbying lawmakers in an integrated manner. Faris retired in early 2005, and the NFIB board selected Todd A. Stottlemyer as NFIB’s fifth President on February 15, 2006. Stottlemyer focused on improving NFIB’s non-partisan reach and technology infrastructure. In February 2009, Dan Danner became NFIB’s sixth President. Under his leadership, NFIB became a driving force in opposing major federal regulations. NFIB gained recognition as the only business association to challenge President Obama’s Patient Protection and Affordable Care Act in the 2012 Supreme Court case NATIONAL FEDERATION OF INDEPENDENT BUSINESS et al. v. SEBELIUS, SECRETARY OF HEALTH AND HUMAN SERVICES, et al. Juanita Duggan was named NFIB President and CEO following Danner’s retirement in February 2016. Join NFIB, a member-driven organization advocating for small and independent business owners nationwide.